Case management for domestic violence cases: We also assist victims in safety planning; court advocacy; filing orders of protection; individual and group counseling for children involved; personal growth development, including goal setting, continuing education, and employment assistance; coordinating social service needs; and filing for victims compensation. Crisis intervention: The center offers counseling, reassurance, and support to victims and their loved ones in the aftermath of the crime. Homicide response: In this area the center offers compassion, support, and guidance for the survivors of the horrific crime of homicide. Services include crisis counseling, court advocacy, individual and family counseling, information about compensation for the crime victims, and referrals to beneficial community support services. Orientation to the criminal justice system: We explain the criminal justice system and track individual cases through the system as well as accompany victims to court and parole hearings. 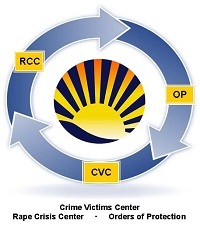 Referrals: The Crime Victims Center also directs victims to other community resources that can provide further assistance. Social services assistance: We help serve the immediate concerns of victims such as food, clothing, shelter, and emergency needs. Victim compensation application assistance: We assist victims and/or survivors in preparing and filing application forms for state victim compensation funds.